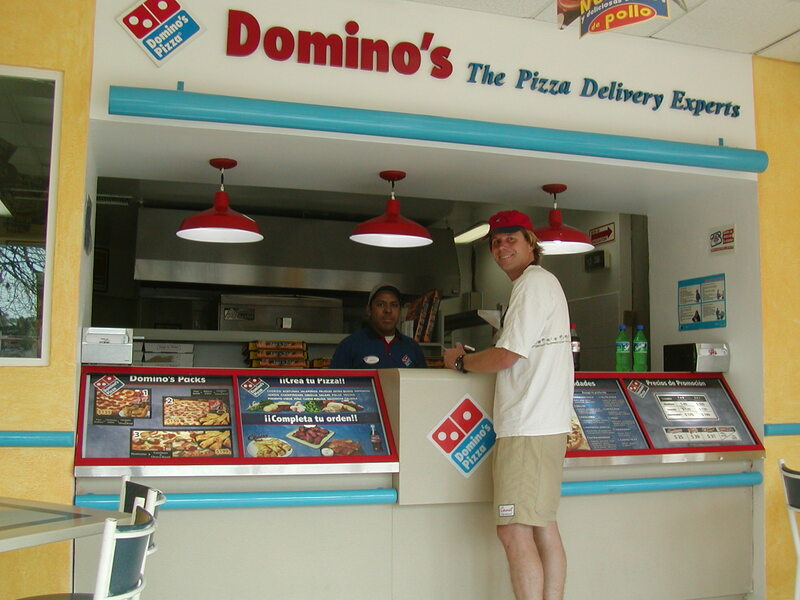 Yes, the kids will do about anything for Dominos! 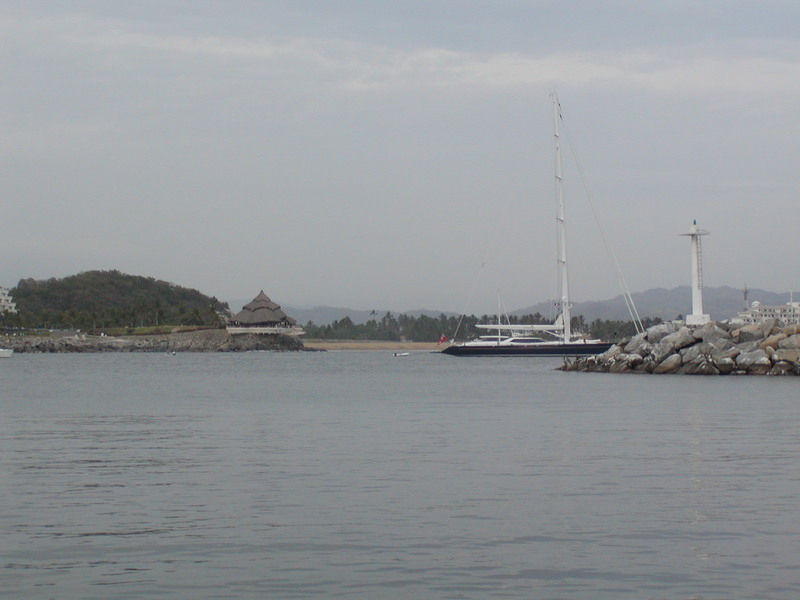 The breakwater at Las Hadas Marina. Hotel on right. In town for pizza in Manzanillo, a 10 minute cab ride up a San Francisco-like mountain behind the white hotel below and down the other side into town. 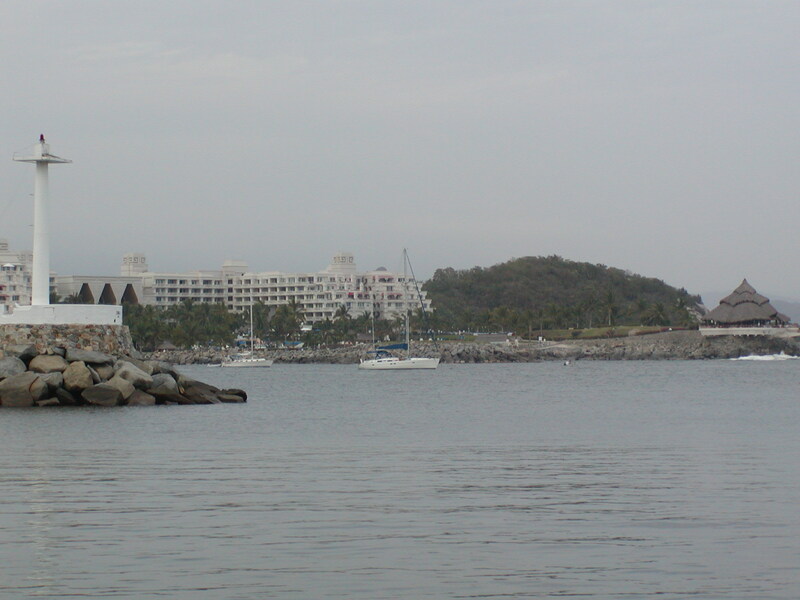 Did actually go into Manzanillo in this same cab ride way down near the harbor which is huge! Lots of soot, smoke stacks, trashy places. Unfortunate that they run all their sewers in Mexico into the water with what appears to all of us to be untreated waste, and that they burn all their trash and have no environmental laws. Makes you realize, and this is a Republican speaking, that those taxes and regulations are worth a great deal more than those of us that promote free regulation are willing to admit without some world travel to third world countries under our belts. However, I'm sure there is a reasonable limit at some point! 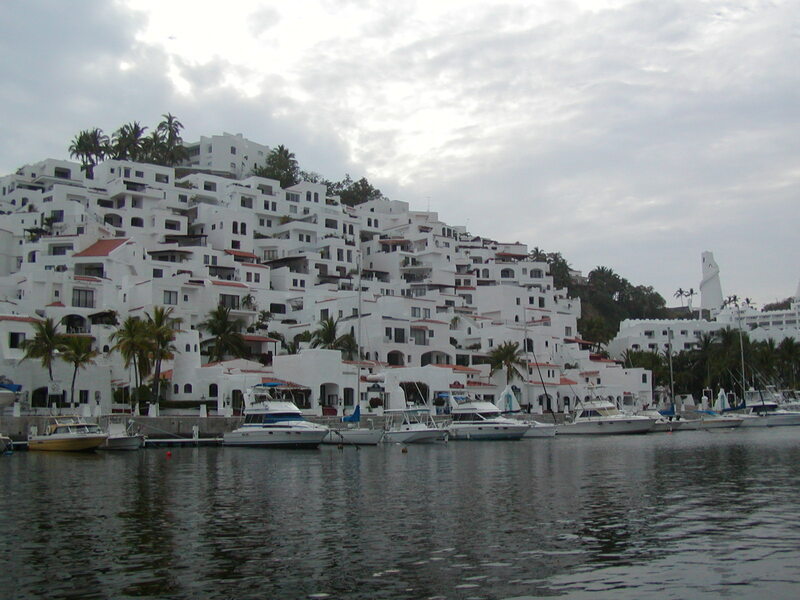 Bungalows and Condos as well as a hotel, on hillside above marina. 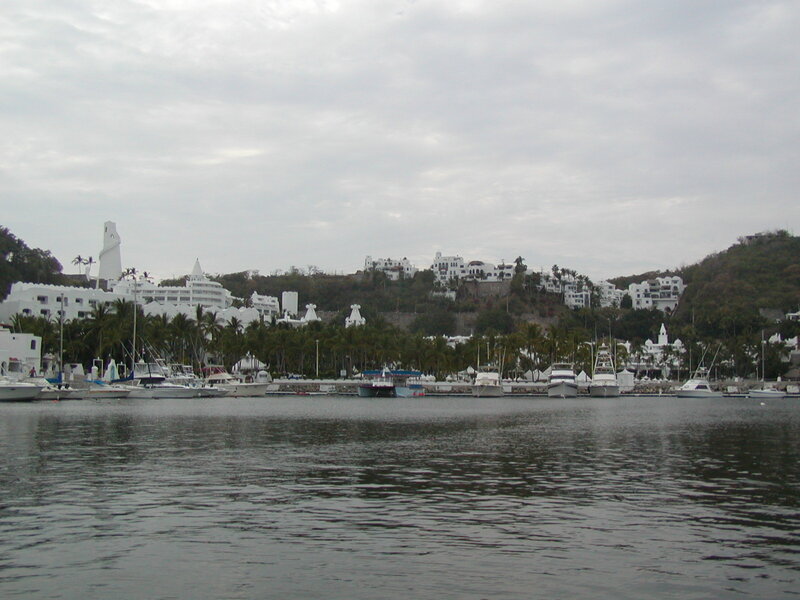 This was my view coming OUT of the Las Hadas marina in my kayak. We are behind the beautiful New Zealand blue sailboat. Look closely for a teeny tiny little mast aft of theirs! They are out of San Diego, but owner is from New Zealand. Lots of them here, all have huge expensive boats! Picture as I am kayaking into the marina to get our paperwork done. Hotel has the spire. For a small fee you can use their facilities. The hotel lobby has THE slowest internet connection, Spanish keyboards, not American, and huge fees to use it ($10/hour US). Never used the hotel pool but paid the $5 for one day to use the dinghy dock. Chose not to go into the marina to dock because it was a med moor situation and we chose not to. The outside area was pretty rolly as the waves and swells do not match the wind in this area. Then, we couldn't make any water because our location out in front of the breakwater, in front of a beautiful hotel, that had parties until wee hours of the morning, was over a river. It was some Aztec-type name on the hotel. Anyway, the river was really a sewer-type thing and we didn't want to get any viruses in our water system! So, we left after 2 days. These pictures are beautiful, but truly, when you get up close, and walk along the dock, its disgusting. Not as disgusting in a poor sort of way like Bahia Tortuga was, basically squalid, but in an unfortunate sort of way. Just a few street sweepers and such and it would have been perfect! Took a drive in a taxi into town to go to the Commercial Gigante. These are huge Wal-Mart like grocery stores that are all completely new since the most recent cruising guides were written. They are well-stocked, fabulously clean and air conditioned, and everyone shops at them. You feel just like you are at home! Everyone is so friendly. We find them all along the Mexican trail and prices are great. They sell great produce, lots of American type supplies like cheddar cheese that you really can't find anywhere else. However, they STILL don't sell chocolate chips anywhere in Mexico! Dangit! TIP FOR CRUISERS: BRING PLASTIC FOLD-OUT CARTS WITH WHEELS! One for everyone on board. They close up and store easily and you can take your laundry into town, you can bring all your groceries home. We live for them. Got ours at various places in U.S. but definitely they are at the West Marine locations everywhere! And, unlike canvas-type wheel carts, which are big, don't fold up and hard to store, they don't get damaged when wet as they are plastic, and they don't mildew from moisture.